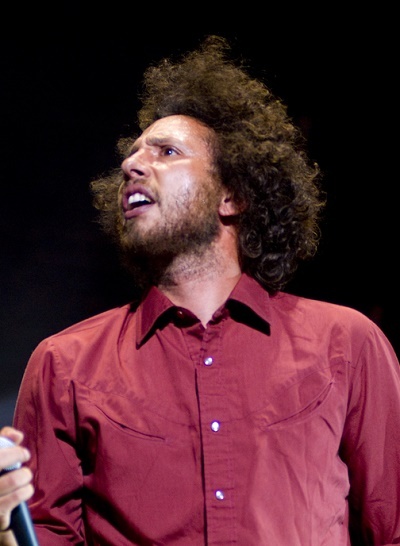 Zack de la Rocha is an American musician, poet, rapper, and activist. He is known as the vocalist and lyricist of the rock band Rage Against the Machine, whose other members were Tim Commerford, Tom Morello, and Brad Wilk. His father is Robert de la Rocha (Robert Isaac “Beto” de la Rocha), a painter, graphic artist, and muralist of Mexican (including Spanish, some African and Converso-Sephardi Jewish) descent. His mother, Olivia Lorynne Carter, is of German and Irish descent. Zack’s patrilineal ancestry can be traced back to his sixth great-grandfather, Juan Ignacio de la Rocha. Zack’s paternal grandfather was Isaac de la Rocha Beltrán (the son of José Isaac de la Rocha Acosta and Sahara Beltrán Ojeda). Zack’s great-grandfather Isaac was the son of Francisco de la Rocha Coronel and María Cecilia Acosta García. Sahara was the daughter of Juan Beltrán López and María Loreto Ojeda Félix. Zack’s paternal grandmother was Cecilia Torres Cañedo (the daughter of Francisco Torres Angulo and María Josefa Cañedo Benítez). Francisco was the son of Cirilo Torres Medina and María Cecilia Angulo Partida. Josefa was the daughter of Francisco Cañedo Aguilasocho and Elodia Benítez Lizárraga. Francisco’s great-grandfather, José Mónico Partida Sandoval, was described as “mulatto” on records, indicating partial African ancestry. Zack’s maternal grandfather was Manuel García Urias (later Bradley Manuel Carter, the son of Braulio García, Jr. and Teresa Urias Figueroa). Manuel was a Mexican immigrant, from Cananea, Sonora. Braulio was born in Tucson, Arizona, United States, to Mexican immigrants, Braulio García and María de la Nieves Camacho, both of Hermosillo, Sonora. Teresa was the daughter of Ramón Urias Ramírez and María Matilde Josefa Trinidad de los Dolores Figueroa Escalante. Zack’s maternal grandmother was Olive Pearl Fleming (the daughter of Orville Leroy Fleming and Clara Belle Case). Olive was of English, French, German, Irish, Scots-Irish, Scottish, Welsh, as well as remote Dutch and Swiss-German, descent. Orville was the son of John Fleming and Nancy Jane Powell. Clara was the daughter of James Thomas Case and Mary Emaline Elizabeth “Emma” Herod. Zack’s matrilineal ancestry can be traced back to his ninth great-grandmother, Ann Sterling. Zack’s maternal grandfather was Manuel García Urias (later Bradley Manuel Carter, the son of Braulio García, Jr. and Teresa Urias Figueroa). Manuel was a Mexican immigrant, from Cananea, Sonora. Braulio was born in Tucson, Arizona, United States, to Mexican immigrants Braulio García and María de la Nieves Camacho, both of Hermosillo, Sonora. Teresa was the daughter of Ramón Urias Ramírez and María Matilde Josefa Trinidad de los Dolores Figueroa Escalante. Zack’s maternal grandmother was Olive Pearl Fleming (the daughter of Orville Leroy Fleming and Clara Belle Case). Orville was the son of John Fleming and Nancy Jane Powell. Clara was the daughter of James Thomas Case and Mary Emaline Elizabeth “Emma” Herod. Olive was of English, French, German, Irish, Scots-Irish, Scottish, Welsh, as well as remote Dutch and Swiss-German descent.